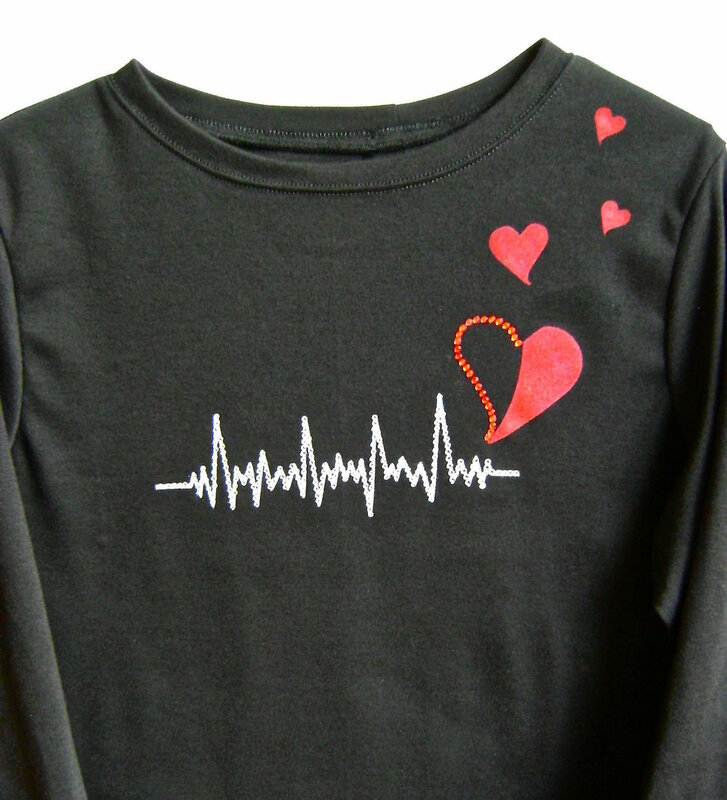 Show your Valentine spirit with this heart beat shirt. 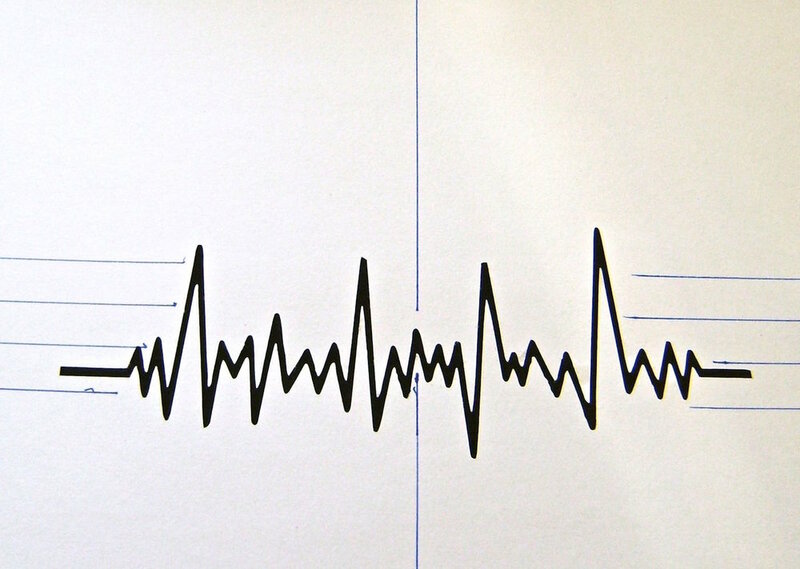 Free stencils for hearts and the heart line are included. Red and clear rhinestones accent the the shirt along with red paint. I airbrushed my design but you can also use fabric paint and a brush or sponge. BEFORE PAINTING, ALWAYS WASH AND DRY FABRIC (WITHOUT FABRIC SOFTENER). DURING PAINTING, COVER EXPOSED FABRIC TO PREVENT ACCIDENTAL OVER SPRAY. ALLOW PAINT TO DRY BETWEEN STEPS. step 1 - Match up the shirt’s side seams and shoulders and pin them together. This will help you find the accurate center front of the shirt. Iron a soft crease in the shirt from the neckline to the hem to mark the center. Slip cardboard between the shirt front and back to avoid transfer of paint between the layers. step 2 - Download and print out the stencils on heavy card stock or copy to blank stencil sheets. step 3 - With a craft knife, cut out the grey areas of the heart line, the complete small grey hearts and only the right side of the large heart. Spray the back of the stencils with repositionable adhesive stencil spray. step 4 - Place the heart line stencil on the shirt first pressing down the cut edges and aligning the vertical middle of the stencil with the center of your shirt. step 5 - Spray the open area with Silver Lining paint. This coat will give you a guide for the rhinestone placement. If you plan to eliminate the rhinestones, you may need to give the heart line one or two more coats with the airbrush to get a brighter silver. step 6 - When dry, position the heart stencils as illustrated. Spray with a base coat of white, then spray the hearts with Atomic Red. Let dry between coats until the red is a rich color. Let dry. step 7 - Cut out the left side of the large heart on the outer grey line. Place it back on the shirt in position and align red rhinestones along the border. Carefully remove the stencil and attach the rhinestones with an iron or rhinestone applicator. step 8 - Place clear stones along the heart line and attach them in the same manner.